Speaking is a highly useful but often under-utilized tool in business. 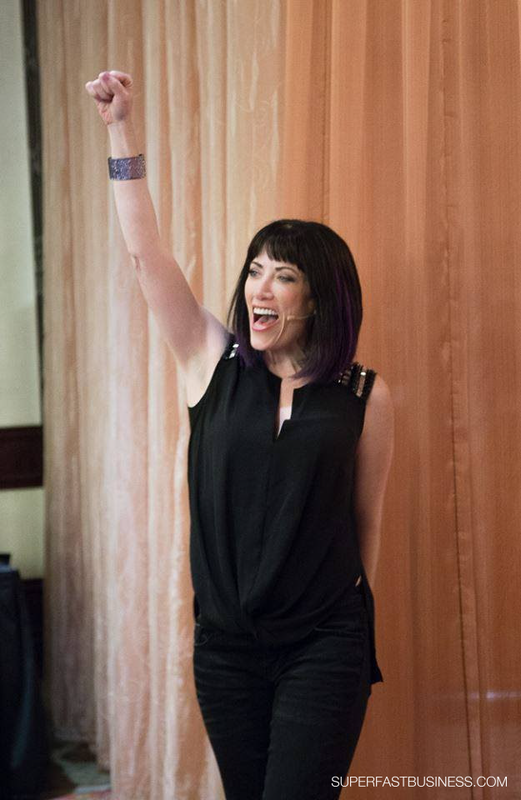 Today, SuperFastBusiness welcomes successful speaker Kristin Thompson to share her input on professional speaking: how to do it well, how to give value through it, how to monetize your skill – while having a blast through it all. 13:30 – Should you memorize? 39:59 – What is your goal as a speaker? 43:50 – Is it all worth it? Does this topic scare you? [Click To Tweet]. Talk your way to more business. [Click To Tweet]. A skill you’ll want to build. [Click To Tweet]. Where winging it doesn’t work. [Click To Tweet]. Audience engagement is key. [Click To Tweet]. James: James Schramko here, welcome to SuperFastBusiness.com. Today we’re delving into a topic that might scare you if you’re the nervous type, and it’s something that I actually went through in my own journey, on the way to building the business that I have now. I’ve had times where this has been more of my attention focus, and currently it’s a little less, but I think this is something that most marketers are going to get to at some point when they get to a certain level of authority. And what we’re talking about today is the topic of speaking, and in particular how you can go from a standing start to being a reasonable speaker by getting some tips from an expert. Today I’ve invited along to the show Kristin Thompson. Welcome. Kristin: Thank you for having me. James: Now you have a website called SpeakServeGrow.com, and you’re all about rocking your talk and profiting from speaking, right? Kristin: Yeah. You know, so many people, they’re great at what they do. They might be a health expert or a financial expert or whatever their area of expertise is. Sometimes the muscle that they haven’t built is how to really talk about that in a way that gets them business. James: Yeah, so we’re going to delve into some of the top topics today. I should just give us a brief introduction. I met you through my SilverCircle program. You came on board to tighten up some parts of your business, but the part of your business that’s super strong is your speaking expertise, and we’ve been working on ways to package that. And one of the interesting observations that I’ve made is how easily you’ve been able to adapt your speaking skills to the online medium. When you combine that with the webinar platform, you can actually make money without having to leave your home now. But you’re using the same frameworks and templates that you had from when you were speaking live from stage, right? Kristin: Yeah, you know, that’s one of the great things about understanding how to share your messages. Nowadays, we can do that virtually. A lot of times, like earlier today, I was texting you, right? “Hey James, had a big payday,” and that’s just like right from your home office, so you don’t have to be on tour, like Tony Robbins or something. You don’t have to live out of a suitcase or be a motivational speaker to make money speaking, and you can do it onstage, big or small, you can do it in your hometown, or you can do it from your home office on webinars or teleclasses. And those are all great ways to get more visible and to attract more leads, and to close more clients. James: Fantastic. So this ties really nicely into a recent post that I put on SuperFastBusiness where I shared the recording from SuperFastBusiness Live with Taki Moore, revealing his webinar model. Now what we’re going to talk about is how you can build up your confidence, how you can structure things to be a good talker and to avoid some of the common mistakes that people make. Let’s dig straight into a couple of the mistakes that people make when they‘re speaking. Now this could be from stage, it could be at a webinar. Let’s just imagine that we have an audience and we’re delivering something. What are the common mistakes that people make? Kristin: You know, that’s a good question. There’s a few. I guess there’s maybe, the first is maybe not trying. I think a lot of people are just nervous to even give it a whirl, but once people are out and they start giving talks, we generally see the presentation style might fall into two different camps. I like to call them “wingers” and “teachers.” And so wingers are those folks who are generally pretty confident in front of crowds. You probably know some folks like that, James, right? Like they actually enjoy the spotlight a little bit. And their challenge then is because they’re so confident, they sometimes skip the step of actually having a plan and a strategy and an outline to follow. What happens when we do that is we’re really up there, flying by the seat of our pants. Your results become really inconsistent because each talk is going to be so different from the next. And a lot of times it can get kind of squirrelly. You know, you forget what you were going to say, you start telling stories you don’t intend to, and then you can go over your allotted time. And you know, maybe if it’s your own webinar it’s not such a big deal, but as I’m sure you know from your experience, speaking from stage, James, it’s like if you have an hour timeslot and you go over, you instantly start losing sales every minute you go over that timeslot. James: Not only that. I know that in some events, they’ll just turn the microphone off. Kristin: Oh yeah, you’re done. Yeah, it’s like, they’ve got to stick to that schedule. A hook comes out, right? James: Just about the most offensive thing you can do to a promoter is to go overtime. They’ll literally sometimes turn off the microphone, they’ll just bring up the emcee, they’ll introduce the next speaker, and you’re out. James: Absolutely. I’m so in agreeance with you in this. It’s called “expert error” when people think they’re so damn sh** hot that all the rules don’t apply for them. It’s like when you see a movie and you see these… famous people generally don’t wear seatbelts in the back seat of the car. It’s so common because they’re different, they’re special. But the laws apply to everyone. Not just the laws of the country but the laws of gravity and force. Like if you smash the car and you don’t have the seatbelt on, that could be bad for you, and I think that’s a metaphor for speaking without a structure. You are inviting trouble and it doesn’t take much for it to go wrong. And I think some of the best speakers will deliver very naturally and organically, but it will have been prepared in advance, and I’ve certainly been through that phase myself. I always go through the slide deck with the clicker a few times before I’m presenting so that I can make sure that everything that I’m doing supports the sale and supports the point of what I’m trying to achieve, because any time you go off-track, there’s a huge risk that you’re moving the audience off-track from the goal that you had set in the beginning. Kristin: Absolutely. And it’s like you know, you wouldn’t go walking a tightwire without a net, right? Like you really want to make sure that you have those pieces in place so that you know where you’re going, your audience knows where you’re leading them, and that you all arrive to the station on time, right on task, on point, and that’s what a great talk structure will do. And so some of your audience might go, “OK, I see a little winger in myself,” And so we don’t want to take away your spontaneity or your personality, but we want to kind of put some bumpers around it so that you stay within the context and the structure of a really good talk that’s going to sell. And then the other camp and the other common mistake is what I like to call “teachers,” and a lot of clients who come to me are struggling with this because a lot of people that I work with are very service-driven, very purpose-driven, as I’m sure a lot of your fans and followers are. And so then there’s like this desire to really, like, “I want to give a talk that’s going to give so much value,” and they pack in so much content, and yeah, we want a content-driven talk. But if it’s all content, content, content and you miss things like interaction and inspiration, and again that talk structure that’s going to close, again you’re going to end up going overtime. And you’re also going to end up overwhelming the audience, either giving them the sensation that they already learned everything that they needed from you and so they don’t need to buy, or just a general sensation of like, “If I just got all of this out of this talk, like I’m afraid to sign up for the paid program.” It actually starts to feel intimidating. James: (Laughs) That’s a great point. James: Yeah, I think it’s pretty common that our audience are overloaded already. By the time they get to us they’re overloaded and by removing things and having less elements and having them handled more elegantly, we can achieve a lot better results. James: I think the interaction’s a great point. I mean I attend events, I sit in the audience, and as someone who’s spoken, I am a pretty critical observer, usually just to myself, of performance. James: There’s some pretty crappy speakers out there, running around, posing as professionals. And it astounds me why they don’t develop themselves more if they’re going to do this for a living. But the engagement one’s a classic. Some people can go for 90 minutes without checking the pulse of the audience, not even once. Kristin: Oh, it’s brutal. Yeah. James: Give us some techniques for audience engagement. Kristin: Yeah, that’s a great question because I think it’s one of the things that’ll really differentiate yourself. I always think of, you know, in the United States we have this popular movie called “Ferris Bueller.” And if you’ve seen that movie, at one point there’s a teacher teaching a classroom of high school students and they’re all bored to tears, and they’re like drooling on their desks, right, and he’s just droning on about whatever, you know, world geography or something. And he’s just put everybody to sleep, and we’ve all seen that speaker. And it is the speaker who talks at you, at you, at you. So one of the things I’m a really big fan of, and it’s even in my talk structure that I teach in Command Any Room is, get people interacting right from your introduction. Don’t wait, because you’re really always closing the room, and one of the ways we “close a room” is by getting them to buy in. So if you can ask a quick question right out of the gate somewhere in your introduction, and get the room to respond, that’s the first sign that you’ve created a connection and it’s kind of a game on from there. So I’m not a really big fan of those super canned, cheesy questions, like, “How many of you want to make more money?” You know, because who doesn’t, really? James: Well, I’m not a fan of that question for a different reason. James: Because it’s an impossible question to answer. Because if one person’s sitting in the room, and they don’t know every other person, how could they answer how many of you? Kristin: (Laughs) That’s a very good point. James: It’s like one of the dumbest things speakers do, is they’re talking to a multiple when really, you’ve got to apply the same principles you use for a sales letter, and that is, you speak to you. James: Now you’re talking to one person. And I have rarely seen a speaker address one person. In fact, I would go so far as to say I’ve only ever seen one speaker do it, of all the people I’ve ever seen speak, only one person did it. And the same person taught me that technique. James: So now we’re sharing it to all the world. The whole world knows. Kristin: The whole world, and beyond, and maybe a few Martians. No, that’s a really great point, and you know, what I’d love to do is start off somewhere in your introduction before you get into your main points, just ask a question that kind of gathers up everybody in the room. So a simple one might be, “Raise your hand if…” I used to teach memory strategies. I still do, in the context of like how to memorize your talk outline and stuff. Because it does help you be more confident, when you’re presenting. James: Nice, yes. So what we’re talking about here is a polling technique, and it’s a great technique. If you’re speaking on topics that I talk about, I might poll the room something like, “Let me see your hand if you already have a website.” “Let me see your hand if you don’t.” Right, so now everyone’s been included. Because almost everyone’s going to lean into that question and feel, “Oh, he’s talking to me.” And you can pick them up with a general blanket statement. So the idea here is engagement by connecting with the individual sitting there or listening to you on a webinar. And that’s how you can do it, using first person, using a poll technique, or a blanket statement. OK, so we’re cooking along now. I was actually really interested in what you said about memorizing your presentation. How important is it to know what’s coming up before you get there in your presentation? Kristin: Well, I think it’s absolutely critical if you want to give talks that are not just entertaining but actually have a result. I’m a really big fan of saying we want to go from compliments to clients and cash, or conversions. Because the danger is, we’re out, and we give these nice talks, and they’re kind of fun, and then you end and then somebody says, “Oh Bob, that was a really nice talk.” And that’s not the same thing as a talk that’s going to build your business, and if you want that kind of talk, you definitely do need to know where you’re leading them. It also alleviates that fear, you know the confidence piece, James, that you were touching on in the beginning. Confidence is so key when you’re closing that people trust you to give you their business or give you their health or whatever it is that you’re offering them. And so, if you can let go and know your outline – I don’t memorize, and I don’t suggest like scripting every word or memorizing every word, but if you know the map, like the path that you’re going to follow – I’m going to open, I’m going to tell this question, I’m going to tell this story, here’s my main points, all the way through to your close, you can guide them confidently. James: Well, put it this way, I actually don’t have words on my slides, generally. James: Images. I’m after an emotional connection and I want them to watch me so that I can share my story. James: I do not want to be reading off a slide. Kristin: Forget it, go away. James: Could an alien ship just land above and beam me up for a probe, because that would be far more exciting. James: Aww no, that’s like Rookie Error 101. James: Seriously. So no transitions, no text, and no Internet. Ever. I go onto the Internet at my house, I screenshot anything that would be required to show from the Internet, and then I put it into my slide and I zoom it up and I make it readable from the back of the room. That’s very important if you’re presenting at an event. James: What sort of thoughts have you got on this? Kristin: Well, I think the key is that, Number 1, memorize the outline of your talk. So you don’t have to memorize every word, but know the flow. Here’s how I’m going to open, again, here’s maybe the question you’re going to pop out, here’s the story… so that you, even if the power goes out, and there are no computers around, I could always give a talk. I don’t need any of that. And you should feel that prepared for a lot of reasons. Number 1, that stuff happens. You know, computers don’t link up, power goes out, funny things happen, so you really want to go prepared. And the key to that, I mean we could obviously go into a whole hour just on memory training techniques, but the key to that is to really think of just a bullet or a word that would trigger each section. So introduction, poppy question, story, point one, point two… you really want to bullet it down to just the core essentials. And be ready to give that talk and know that outline well enough so that should everything fall apart, you could still follow that flow and get your message across. James: Do you have a template? Kristin: I do. You know, in Command Any Room I teach a pretty firm template that works online and off, and it’s a lot of the things I’ve been mentioning. You want to start really strong with a sharp introduction, you want to absolutely pop a question out that gathers that room. And the other big thing I’m a fan of to get interaction in the beginning is what I like to call the “Wow demo” which is, you know, something that will really grab people’s attention right from the beginning of your talk, something that might shake up the room. It could be a startling statistic, it could be a quote, but you really want to grab people’s attention right from the get-go. James: Quotes are fantastic to include, because they make you look kind of clever, like you’ve researched something. James: Oh, I mean it just proves that everything you’re talking about is pure fact. Because you can do quotes. James: I’ve learned a few frameworks too, I might put a couple in there because they tie in with exactly what you’re saying. One of them’s why, what, how, what if. You know, why do people need to know what you’re covering; what is it; how does it actually break down and then cover off some objections, and I’ve talked about that framework a few times in this, in fact the most popular post on SuperFastBusiness is the How To Create Information Products post. So that’s a great framework for that. I remember going to a certificate for workplace assessment training, which is basically how to deliver training programs in the workplace, to a government-approved level, and they gave out some acronym, called GLOSS. And I remember the first parts of it. G was Get attention. L was Link to the outcome, link your attention-getting thing to why they need to learn this thing, and then, I think, I’m just going to make it up from here. I think O might have been for Outline, what you’re going to talk about, and then S might have been Story, and then the other S for Summary. So that kind of framework will work well. But I remember the example that I gave in the training, we actually had to give a presentation, and I was teaching people how to tie a bowline knot. Kristin: Now do I have to pretend like I know what a bowline knot is? James: And then I said, “What I’m going to teach you in the next five minutes is how to take this rope, wrap it around your body, and tie a knot without letting go of the rope at all.” And then I talked about how you actually do the knot, and then I summarized it again. So you can actually, if you hold the rope with one hand, and put it around your back with the other hand, you can tie a bowline knot without letting go of the rope. It’s fascinating. And it really could save your life. Kristin: I now might have to go Google that. James: Yeah. It’s called bowline. It’s a wonderful knot. Very strong, easy to make. Easy to undo, which is very rare with knots. James: There’s little stories about make a rabbit hole, the rabbit goes down the hole, around the tree, and back out the hole. That’s how you do a bo-line. OK? So you never know what to expect from these tips. Kristin: You never know. We’re giving life-saving tips here. This is a free podcast, can you believe this? Kristin: What? What is this man talking about? James: Exactly. And then I linked that story to being important. What I did is really I just ripped off the email that my friend Walter wrote for me and was very successful. It generated probably $10,000 in event ticket sales, just from telling this story about how my kid had shoved paper towel down my toilet and blocked it. And the whole premise was, as bad as my day was, because I was inconvenienced with having to go offsite to do my daily business, my day wasn’t that bad, not like some businesses where they’re having a terrible day because they didn’t learn marketing and business fundamentals, which they could have if they’d just come to my event. Kristin: Ah, there we go. James: So, what we’re talking about here is really these creative stories and angles to bring people’s interest and attention. Now if they’ve been bored to death by six speakers prior to you and you get up on the platform, you want to bring your WOW factor, right? Kristin: That’s right. Yeah, it’s so important. You know it’s really good anytime you’re going to give a talk to really consider your surroundings. It’s one of the things I talk a lot with my clients about is what’s going to happen right before you give a talk. If you can inform yourself, find out from the event organizer, like what happens beforehand, who’s going to go up, what are they talking about. So you have some context. And then be in the room because, yeah, that’s happened to me, where a room has been droned on all day. And now it’s 3 in the afternoon. They’ve been bored to tears, and now I have to go up and give my talk, then I know for sure I’m going to have the team pump up some party music, I’m going to get everybody on their feet, clapping their hands. You’ve got to shift the energy in the room. That’s a really important piece of giving talks is not just the content but just understanding that you have to manage their experience, their emotions, and their energy so that they can actually consume what you’re about to deliver. James: I love that. I love going into a dead room and waking them up. Kristin: It’s great! You’ll make a lot of money if you do that. I did. James: I did. I went on day 3 of an event and it was a very boring event. I was last. There was like a dozen speakers and I cleaned out the room in terms of sales and conversions, because I brought what the audience wanted and they were voting, yes, thank you very much. We’ve been waiting for this. It’s like when you play golf, when you finally get a good game. This is what walking around these 18 holes was all about. Finally, I’ve got one under par. Kristin: Yup, it’s so true. James: I was sitting at the back, I was waiting for the right wave, and you finally crank one amazing wave out of a bad session, and you’re like, Yes! That was it, that was the one. Everyone knows it, it’s so obvious. Kristin: Well the thing is that they’re craving it, whether somebody signs up for your webinar or somebody comes to an event, they want to be entertained and inspired and educated. They’re begging for it. So, that’s why it’s so important to figure out, you know, how can you get your message across in way that’s comfortable, that’s engaging. Get people taking notes; that’s another big thing that’s so simple in terms of interaction. Just tell them, “Hey, grab a pen, here’s what you’re going to want to jot down.” If you just direct people to take notes during your talk, when you go to close the room, you’ve already broken that barrier. That’s another really common mistake I see is people talking at the audience, they never ask them to pick up their pen, until they ask them to buy. And it really can create a super awkward moment right at the end. So if you get people jotting down notes the whole time, and you’re telling them what to jot down, you’ve already kind of set those pattern, and now when you make your offer, it’s like smooth sailing. James: Yeah, I’ve seen someone take this to the extreme. He would have them standing in chairs, shouting, running up and down, it’s all sorts of little mind games and tricks. I’ve seen speakers give away a free CD and make every person in the room run around at the back of the table to train them that’s where they go to buy. James: It’s kind of gimmicky and cheap to someone savvy like me who’s seen it all before. But I know exactly what they’re doing. They’re training their customer exactly where to go and to obey all instructions. James: I think do it, but be fair to the consumers. Kristin: Yeah, don’t be creepy. James: Yeah, it is creepy. Kristin: I’d really draw the line of being creepy. I don’t mind people taking notes but I will not be creepy. James: Some of the most manipulative ones I’ve seen, where they will Pied Piper everyone up to a private room or to the back of the room to make the offer there and stuff. And I think that’s just a little bit vomity. Kristin: Well the worst, I’ll tell you the worst talk I ever went to was here in Portland. I went out of curiosity. If you want to be a good speaker, be a good consumer and see what’s out there and check people out. So, this guy was pretty big at the time and he came into town, and so he comes on stage, he told of course like a big story about how rich he was, and he showed a bunch of pictures of all his “richy-rich” stuff. James: I’ve seen a documentary for one speaking organization, they actually make the consumers ring up their bank and increase their credit card limits in the room. Don’t be douchey like that. Kristin: Yeah, I’m not into any of that. James: I mean this might be comforting for a listener to be able to find out. We know what the tricks are, we’ve seen it all before. That’s not what we’re talking about here. We’re just talking about simple stuff. And you said something which was pure gold and I think a lot of people missed this, and that is to turn up and be in the room before you go on stage. There’s nothing worse than when the third speaker in a row on the same day gets up and says, “OK, you want to make some fast money? Turn around, now reach into the pocket of the person behind you, and take out their wallet. Hahaha! See, I showed you how to make fast money.” Like when that’s the third time it’s been done in the room on the same day, you know they’re not turning out for the whole show. They’re not getting any context. They’re not delivering any value. It’s like, oh, please, please, please! Kristin: Well there’s so much gold in understanding well first off, as you were saying earlier is, do you need to shift the energy in the room? You might need to calm the room down; you might need to fire the room up. So the only way to know that is to actually be there and feel the energy in the room and that’s one part. And then the other part is exactly what you just touched on is what was happening beforehand. Something horrible could have happened or something amazing could have happened or even just the topics of the other speakers, if you can tie those in to your message. One of the events that I spoke at, the room was a little dry. It was a little heady all day. There was a lot numbers, talks about numbers and finances and stuff, it was a little dry but good content. But it was a perfect segue when I came in to say, “OK great, you’ve been talking about how to manage your money, and how to monitor your money, now let’s talk about how to start generating that income. Let’s talk about how your message can generate that income that you’re going to monitor and manage.” So it made sense. It was so easy for me to slide in with, how does this fit in with everything else that you’ve been taught so far. Those are really key when you want to convert a room is knowing the energy and knowing how to fit your offer in with all of the other stuff that’s been talked about. James: Perfect. Well I think that, I’ve always been able to use the presentations before me to help the audience to get more value by giving them more depth or context. Occasionally. I’ve done this once that I can remember. I went to an event, it was an extremely… it was a shocking event in terms of what they were teaching. It was an MLM event. I’m sorry that I went to it because I was later, they gave my presentation to all these MLM spammers who started loading it up to YouTube. I’ve actually put a disclaimer on my site, just making sure people know I don’t endorse this product. I was merely invited as a guest to deliver some content. And some guy got up before me and said, “Use lots of pictures of your kids all over Facebook. People love that sh*t. Use them everywhere in your marketing.” I’m like, I got up and said, “Listen…” Because I’m teaching people how to market and not be a douchebag, to try and help them do marketing, instead of just buying traffic and telling people they’re going to be rich, and I said, “I just want to say a kid doesn’t really have the choice whether they’re on social media or not. And everything you put up there is there forever. So if you really care about your children, just keep in mind in 10 years’ time, they might come up to you and say, “Mommy, Daddy, why did you pawn my image off for some douchey MLM scheme?” And they might horribly regret that. So that’s one time where I’ve gone against something that’s been said. In a multi-speaker environment, I’ve often put forward an alternative point of view without straightly deriding someone else. So they’re now feeling, “Wow, this has been a good seminar ‘cause it’s all starting to snap together for me. I’m starting to get the full picture.” And I’m harnessing the energy that the other speakers have put into the room, and picking that up, and piling that on top of my own presentation to maximize it and the promoter loves that, the event organizers. This speaker is a good choice, the audience love it, they’re happy they paid for the ticket, they get great value. I’m going to invite them back. If anyone ever asks me about this presenter, I’m going to give them a great endorsement. Kristin: That’s right. You know so much, you know about having any career with speaking, or even just getting partners, being invited to be on a podcast or any of these things is about building good relationship. So everything we’ve talked about today from being prepared, show up, be in the room a little early, figure that out, know your talk, know your talk so if the power goes out or anything funky happens, you can still be professional and deliver, be interactive, the audience is begging for that. But all of those things, not only do they help you make more money, but you’re right, you’ll get invited. I mean you and I are both constantly being invited to speak at events or be on interviews because people know and trust that we’re going to give good content, it’s going to be engaging, it’s going to be interactive, and we’re going to treat people well. And that’s not that difficult to do, and yet, not as many people are doing it as you might imagine. James: Yeah, very cool. So, what haven’t we covered that we really should? I think we should talk about, let’s just talk for a minute about dealing with promoters, whether it’s an online event, whether it’s an offline event, the seminar scene. I mean I’ve seen the ugly side of it, I’ve seen the good side of it. I’m also an event promoter, so I can relate to every angle on this. I’ve spoken, I’ve sat in the audience, I’ve run the events. Everyone’s got their own considerations. But what sort of straight skills should we know before we get too far down the track? Kristin: Yeah good question. I think for a lot of people, first realize that there are speaking opportunities just in your hometown. Like if you’re just getting started, don’t get overwhelmed. Just go look at your local like here in United States we have a Chamber of Commerce. It’s like all the local businesses get together and kind of have a little community. Or there are business associations or networking groups where you can just go and speak and there’s no boogeyman promoter. And there’s nothing crazy happening, and those are great opportunities. You can get lots of business speaking just friendly places in your local market. You speak for free; you can make an offer and off you go. And then as you start kind of rising up the ranks, you can go speak at bigger live events or host your own like you and I do. And now you get into, I will say, just be aware you’re swimming with sharks now. I mean, you know there’s some good fish but there are some sharks in the water. Here in the United States, sponsorships have become really popular and some people are really pushing them in a way that can actually be a little bit dangerous. So if you don’t know your closing ratio for instance, if you don’t have in other words, a consistent track record closing rooms, then paying money to go get in front of an audience makes no sense for you. So that is not a place to start. But it is a place that you might decide to go to once you have that consistency under your belt. James: Well I was going to say that we’ve had a few discussions about this, and we also came up with the idea that you can always negotiate and come up with your own terms. And if you’re an in-demand presenter and that audience is right for you, quite often the promoter will overlook standard rules and regulations. If you position yourself nicely and if you have a wonderful reputation especially if they come looking for you, you can always negotiate this stuff. Kristin: Yeah, you know like any partnership, it’s about building a good relationship. And again if you have great content and you’re interactive, and you know your stuff, and you’ve earned that reputation, people will want to work with you. And then it’s just about nailing down the details. So whether it’s a profit share, which is a great opportunity, where let’s say, you come and speak on somebody’s stage at their event, and you’re going to split whatever you sell 50/50, great! That’s a win-win. And what started happening, I think probably more so here in the States than in Australia is, you know, the sponsorships started because people wanted to cover their bets and say, “All right, I want to at least be able to cover my expenses.” So what if the speaker paid some cash up front, and then maybe a little less split on the back end. And the thing is that it went like a little crazy where the sponsorship fees started getting so exorbitant and the danger is, if you don’t really know how to convert that room, the return on investment is going to go a little bit, you know, hard to get out of it. The bottom line is, look for events where you’re going to get in front of your ideal audience, do business with people that you would want to partner with that are reputable, and don’t get into a situation where you’re investing gobs and gobs of money if you don’t have a consistent closing ratio. So unless you can pencil out that you’re going to get return on your investment, then it’s not a good deal. Just like any bit of business. But I think what happens James is, sometimes people get so excited about the allure of being on somebody’s big stage that they forget to pencil out just the basic math. James: Well I think it’s ego takes over. And what I’ve seen with many speakers is they just become almost unhuman. They’re monsters. One of my favorite stories was this guy, professional speaker, purporting to be an online marketer, which is very common. I’ll give you a hot tip. If someone speaks 280 to 380 times a year, their online business isn’t going that well. Kristin: Knock, knock, they’re not an online marketer. James: This guy went to the back of the room when I was on platform in Melbourne at a big event. And he went up to the audio crew and he said, “Wind this guy up earlier, I want more time for my slot.” But he still got 30 minutes. “Yes, well just show the cards early, he won’t notice.” And like it’s dog eat dog in some environments. So that’s the worst and ugly side of it. My biggest tip for the would-be professional speaking circuit person is make sure that your promoter will pay you, because that’s one of the biggest problems I found. They’re slow payers, they usually financially destitute. Kristin: It’s like the Wild West! James: You could write a book about this. For that reason, the most speaking that I do is more keynote style, I’m just delivering content, I’m not trying to close a room today. I’d rather just go and visit my site at some point, log-in for my free course, and become a customer down the track. And what the promoter is getting from me is amazing valuable content that helps people say they had a great event. I’m very picky about where I speak now, and I get more requests than I accept. So I’m in a fantastic position where I’ve built up that track record. Even at my own events, I don’t really pitch at them. But the main thing that I’m looking for is for my people to have a great experience and to come back each year, and to build their knowledge, and to be super successful and to reinvest some of that back into my business, which they do, because there’s that long term relationship. So, it’s important to know what your goal is as a presenter. You do want to monetize it today, and you certainly can. You’ve just cleaned up two webinars in a row, and that’s because you’re helping people learn their skills from scratch. And rightly so, some of your case studies are phenomenal. I think one of your students went from like 0 to 6 figures in a short space of time. Kristin: Yeah, I mean it’s true. You’ve got to look for the right environment. There are smaller places where you can go speak, where you can run the sales through your own system. You control the dollars. So there’s safer environments. It’s really about picking the right platform, the right audience, and having the right message and structure to follow. And then you can do it successfully, but you’ve got to watch what waters you’re swimming in. Kristin: We we’re going to need that safety knot again. James: OK. So let’s just bring things into an actionable checklist here. A little recap. We’ve sort of covered some of the ideas around the fact that you can start from scratch and be comfortable with it even on a local platform and a small environment. It’s pretty low-risk. You don’t even have to leave the home if you just want to run a webinar as we’ve given you some tips. Know a lot about your audience. See what else they’ve been exposed to. Sit in the room. Interact with them. Ask them a poll or issue some kind of a blanket statement. Don’t wing it. Do a little bit of practice before hand. Don’t over teach, instead, just cover a couple of vital points that leave people a great idea of something that they can use but also wanting a little more. And talk to the audience as a person, as a singular you, instead of a how many of you, ‘cause that’s a very common error. Have some kind of template or format, but most importantly, start off with a pretty big impact to make people sit down and pay attention to what you’ve got to say. And have them engage in the beginning so that there’s no surprise if you have a call to action when you ask people to do something. They’re certainly feeling like it’s been a good relationship to that point and they’re happy to do it. You should have a clue as to what your presentation is going to look like as it rolls out, make sure that you are keeping your text minimal, your transitions and your technology simple in case you get caught. And… I mean the very first one I did, the projector was locked in a cabinet and I had to run off to get my printed-out notes. So it will absolutely happen no matter what. James: It’s going to happen. Have a little fallback. Have a parachute you can safely jump out of the plane with. What have I missed? And then as you build and you start going up the ranks, just looking for those right opportunities and watching out for really who you want to do business and making sure that you remember that every speaking opportunity is there to build your business, so don’t get too wowed, right, or glossy-eyed by the stage but really look at the business-building opportunity as a whole. Kristin: Yes, this crazy mixed-up world we live in. James: But is it worth it? Is it all worth learning about and putting up with? Kristin: Oh, my gosh. It’s so worth it. I took my business really from being a big fat nobody baby-mama in Portland, you know, just trying to scrape by, making, whatever, $30,000 to doing six figures to doing mid-six figures, all really with one talk. And so, if your listeners leave with anything, just know, it’s about having one rocking talk that you know can convert consistently. it has absolutely built my business to a place where you know, because you helped me. I’m hanging out at home with my family most of the time, I travel a couple of times a year, and so it’s a great way to get visible, get leads and get clients in a way that’s really leveraged. And I wouldn’t do it if it weren’t well worth it. It’s a blast too, look, we’re having a good time, too. James: We are. Yeah, it’s great, and you know, if you do it right, you can end up with some fantastic fringe benefits. You get to travel. In my case, I’ve travelled the world, most years, actually, every year for the last few years I travel a fair bit, and it is one of those things where you get introduced to a lot of new people, you get to find out amazing things about different cultures, you grow in yourself because it’s challenging and you stretch. But it also has wonderful side effects. It gets you better known in your industry, it brings in a high level of income. Everything else you do lifts up because of it. And if you’re clever, you can automate or leverage some of it by going online, combine it with webinar models, and a free course to give away on the front, you have a powerful business. So thanks so much Kristin. Hopefully, we’ll get a couple of questions in the comments here at SuperFastBusiness.com. I hope you can stop by and answer a couple. Kristin: I’d be happy to. And thanks so much for having me. Excellent! Very engaging podcast today with great tips and ideas on improving your speaking skills. Loved this! Thanks Kristin and James. Kristin, anymore memory tips? There are plenty of things you can do to remember your story. For example – Assign a point per finger so you can link ten points together by touching that finger as a reminder. You can make wildly imaginative stories to remember things by association. There are plenty of books on memory techniques as well. Hi James, you mentioned that we should use 16:9 aspect ratio. What if the hosts have an old 4:3 ratio project? Would you still use 16:9 and have the black bars top and bottom, or would you match the 4:3? I use 16:9 and have black bars. I really appreciated this podcast! It was great being introduced to Kristen – you’re a total rockstar! And James I remember your Underground talk very well, you and other really engaging speakers who stand out from the crowd do it for several reasons, but especially how you connect with individuals and get us emotionally invested in your story. I didn’t realize that technique of talking to “you” was so important, but I get a lot of comments about that on my instagram posts. They say “I feel like you’re talking to ME” a lot, and that’s something I”m going to consciously cultivate in other areas now. Kristen, I really appreciate the value of being there to feel the temperature of the crowd before you go up to speak so you can bring the energy up or down or whatever is needed. But how much time should you spend at the event listening to other speakers before you present – does it sometimes dilute your own presentation, or can it be beneficial? Thanks again for such a great talk. I like to learn the room so that I can connect better. Nothing is worse than not knowing your audience. Delivering a great talk but lacking context can be a disaster. “Could an alien ship just land above and beam me up for a probe, because that would be far more exciting” – is worth the annual membership alone. Quote of the year from the Boss.